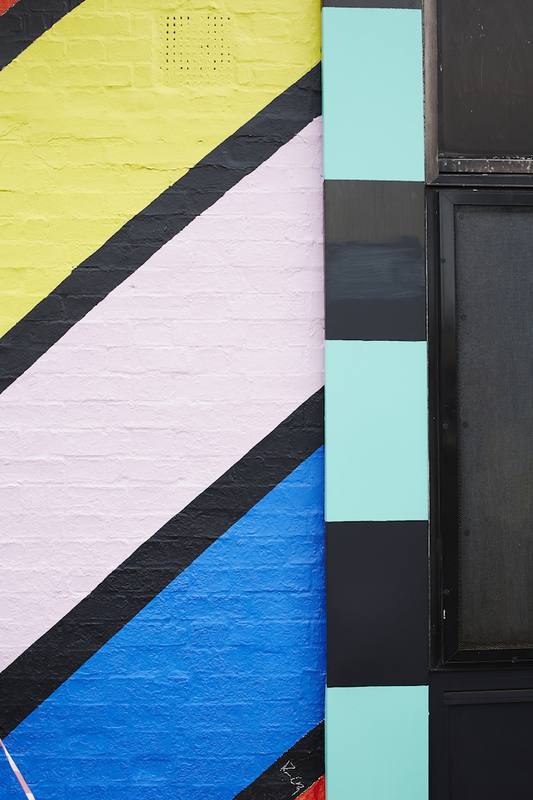 French-born, London-based pattern queen Camille Walala has created eye-catching street art, murals, homewares, fashion, accessories, and installations, all sporting her trademark vibrant digital prints. 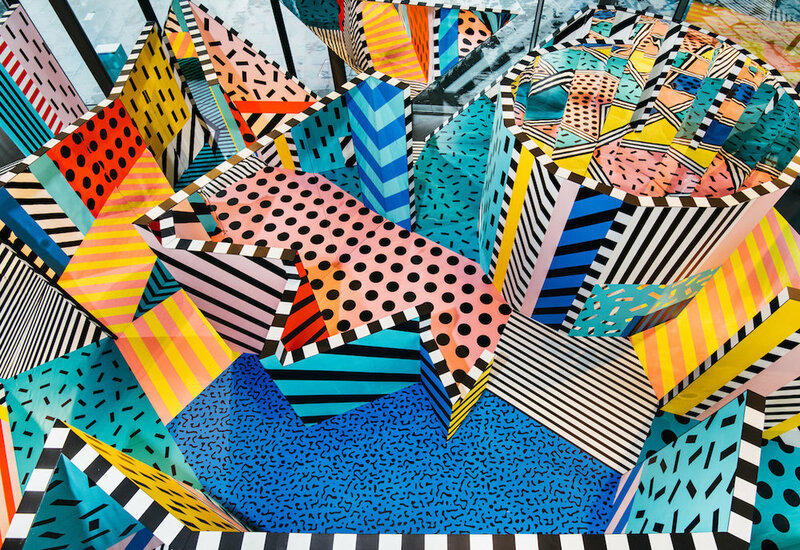 The textile design graduate collaborates with top global brands, from Converse to Nintendo, and is now the star of this month's London Design Festival 2017, designing key commission Villa Walala, a pop-up inflatable playscape guaranteed to brighten up your day! What inspired your LDF17 project Villa Walala? Villa Walala is about creating the unexpected. It's in an open square in Broadgate, a City area surrounded by big offices, where people meet up, have lunch and relax. I wanted to design a giant stress ball, something people could squeeze, that would take them by surprise. It's an inflatable, soft, flexible tutti-frutti space, with round shapes, and a very bright colour palette. There are also deckchairs on the grass in my style of pattern. When people take their usual route into work they're going to go, 'What the hell?' I want to create a reaction, to make people talk and smile. What’s your design or style philosophy? A lot of people call my style Tribal Pop. It’s bright, bold and happy! When I was younger I was influenced by the styles and objects that my parents brought into the family home. My dad, who is an architect, had quite an extension collection of Memphis pieces in his house, so for me the movement is interwoven with memories of my childhood. I was always surrounded by colours and beautiful pieces of design. Which colours and patterns are you drawn to? Much of my inspiration comes from growing up in the Eighties and the Memphis Movement. In 2008 I found a book about Memphis and was so excited turning the pages. This was design with an element of playfulness, and a sense of humour – I loved it. I use a lot of black and white with pastels, and block colours. I have also drawn my pattern inspiration from African tribes like the Ndebele, known for their geometric painted houses. I find them both full of joy. 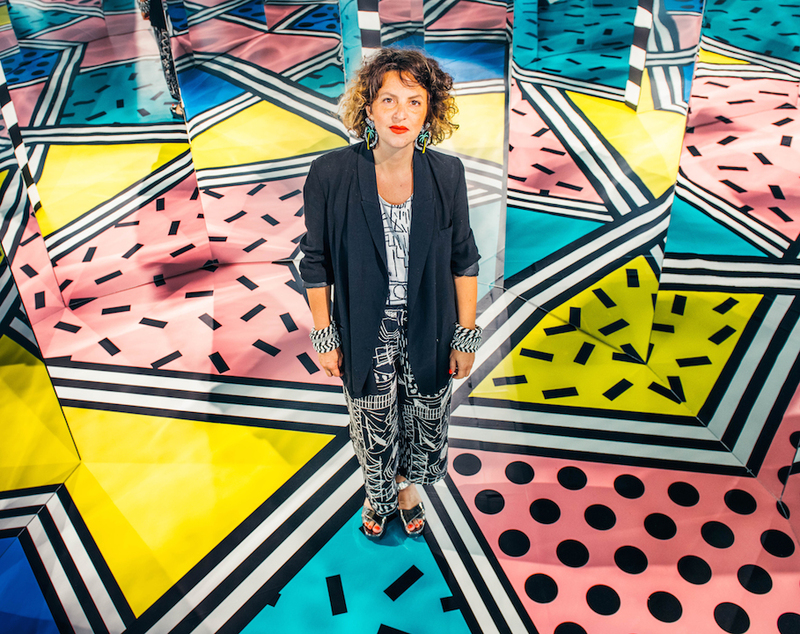 ABOVE: Camille Walala with her graphic, patterned WALALA X PLAY project – proof stripes, and dots, never go out of fashion! You started your studio in East London in 2009. What got you into design? I came to London in my twenties to learn English and was working in restaurants. I like colour, putting colours together. I can't really draw so I did a printed textiles course at the University of Brighton. I still have a really childish drawing style, I can't even draw a flower! How did you make the leap from textiles to wall art? I still work on a small scale in terms of patterns, as you do with textiles, and then apply it to a bigger scale. I do a lot of sketching, and collage, and play around a bit. I don't like working on computers much. I prefer the playfulness of collage, and then finish pieces off on the computer when you need the measurements or precise colours. When the gallery asked me to create an interactive installation I was petrified, as I'd only done textiles and wall art before. I love the fun fair and wanted to make people bring out their inner child – to get lost, like in a hall of mirrors – so we came up with a playful design. I simply wanted to give them a good time. I was worried that no one would come, but we had so many turn up we had to create ticketed time slots. Young and old people were telling me afterwards how happy it made them. I was so touched! Nathalie Du Pasquier [a founder member of Memphis, who now paints]. She doesn’t want to hear about the Memphis movement these days, as now she just wants to do something new. As an artist you have to please yourself first. I also love Sonia Delaunay, who emerged in the Twenties and Thirties, and was one of the first artists to do Art Deco and make it accessible to everyday life. Her colours are beautiful, and she designed costumes, ceramics, and textiles, making art you can enjoy in your home. I recently got the chance to see some of the earliest work by Op Artist Victor Vasarely, another hero, at Fondation Vasarely in Aix-en-Provence. The bigger the better! I want to do a Vivid Sydney light projection on the Sydney Opera House! I don’t want to move away from my current style but I’m interested in some rounder shapes. I’d like to push my creativity in terms of pattern and colour – although I'm not going to start doing flowers! I try not to look at things any more. You can accumulate too much information in your head. I prefer to do my own thing. I like to play with shapes. I go travelling a lot, and love taking pictures. I went to Mexico recently, checking out Luis Barragan's buildings and taking pictures of pattern, and the colours were so beautiful. Vancouver for the Interior Design Show festival. I’m doing a talk there on 30 September. And then New York to see the Ettore Sottsass retrospective at The Met Breuer. I’m also going to Brixton in London to work on a mural for an after-school care facility for charity. The place has very bright lights and awful colours on the walls. I’m going to put that right! Have your worked on other social design projects? I recently did a mural in a psychiatric hospital with pastel colours. It was nice to be a part of it. Being in a mental health institute that looked drab would make you feel even worse. It's depressing, like no one gives you any value. 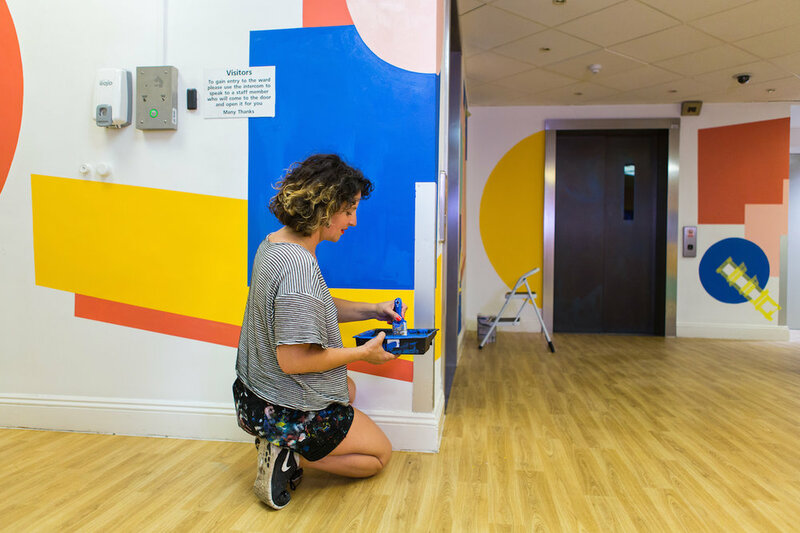 It was for a charity getting artists to paint these spaces and the patients really liked it. A little colour and pattern can create a warm feeling and make a big difference. I’d like to do a council estate one day – the uglier the better! I definitely like Instagram. It’s my best agent and I get a lot of my work through it. It offers so much possibility to be seen and discovered. When you share colourful stuff I've found people follow you more. Villa Walala is at Broadgate's Exchange Square, 100 Liverpool Street, London EC2 from 16 to 24 September 2017 (7am to 9pm), behind Liverpool Street Station. 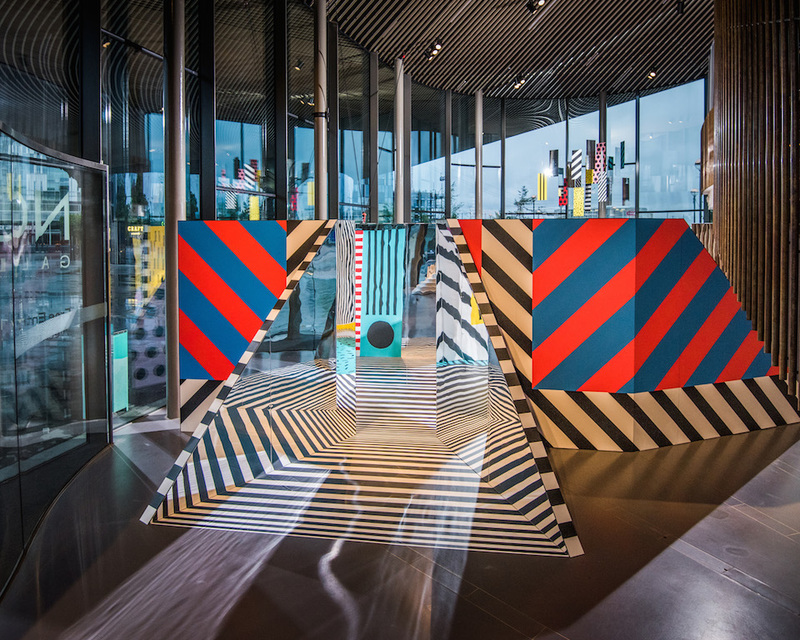 Find WALALA X PLAY at NOW Gallery, The Gateway Pavilions, Peninsula Square, Greenwich Peninsula, London SE10 until 24 September 2017; book free ticketed 15-minute timed entry sessions in advance (10am to 7pm weekdays, 11am to 4pm weekends).